The Active Groundwater Level Network contains water levels and well information from more than 20,800 wells that have been measured by the USGS or USGS cooperators at least once within the past 13 months. This network includes all of these wells, regardless of measurement frequency, aquifer monitored, or the monitoring objective. The U.S. Geological Survey has a database/archive of about 850,000 wells across the Nation. Information about these wells is available to the world via NWISWeb (http://waterdata.usgs.gov/nwis/gw). 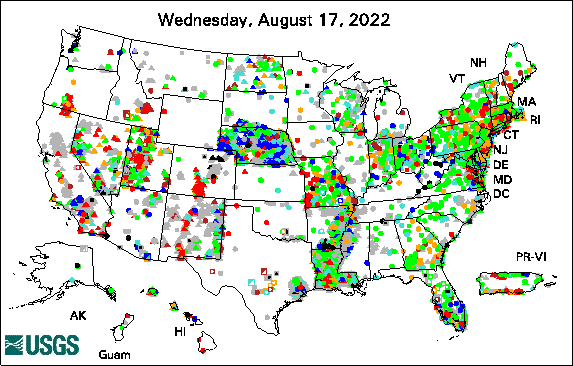 Through various groundwater programs, the USGS actively measures water levels in, or collects data from more than 20,800 of these wells each year. These wells are measured for a variety of disparate purposes, such as statewide monitoring programs, or more local effects like monitoring well drawdown, hydrologic research, aquifer tests, or even earthquake effects on water levels. There also are a variety of networks among these actively measured wells; a National Climate Response Network for wells, Regional Networks like the High Plains Aquifer Monitoring Program that is designed to monitor storage changes in the High Plains Aquifer, state-based networks that are designed to monitor statewide groundwater conditions, and local networks designed to monitor pumping effects. Groundwater Watch is maintained by the Office of Groundwater.